Or maybe it’s actually her death day party? Either way, today we have a photo I’m particularly proud of because it started out with the railing of the balcony heavily obscuring the scene. After compositing several photos together and throwing in a bunch of additional Photoshop magic, I think it’s barely noticeable that the shot didn’t always look like this. And now we have a nice, unobscured view of these happy haunts’ celebration. 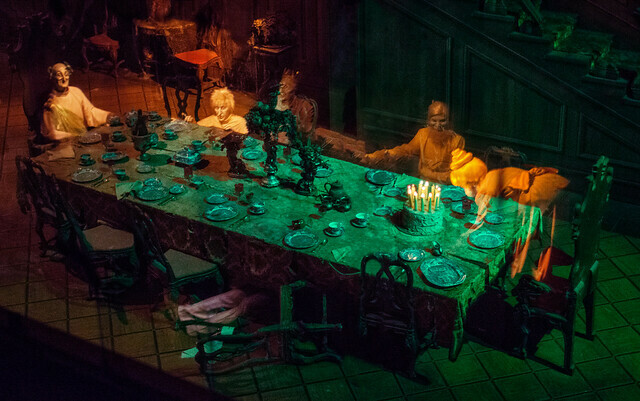 This entry was posted in Haunted Mansion and tagged animatronics, dark ride, ghosts. Bookmark the permalink.